Let’s talk about our new products. The blu PLUS+™ gives you better performance and lasts longer due our new cartridge technology. Not only that but its ultra-sleek design makes it easy to carry wherever you’re going. We’ve also updated our blu PRO™ Kit with improved smooth flow technology, giving you a smoother and cleaner draw. We’ve overhauled the flavours to give you better performance and taste. All of our e-liquids will now be made in the USA with domestic and imported flavours. They are exclusively designed to work with our products. If you have any questions feel free to reach out to us on Twitter and on Facebook. Or contact our Customer Service for free on 0800 0149 355 or drop us an email at support@blu.co.uk. Having introduced you to our renewed kits and flavours, you might have questions about the compatibility with your current kit and blu products. Can I use my old blu PRO™ with the new blu PRO™ Kit? New blu PRO™ clearomisers are not compatible with old blu PRO™ Rechargeable Devices. However, the older version of the blu PRO™ Clearomiser can still be purchased on our site, so there’s no need to replace your kit immediately. Can I use blu® Liquids in my original PRO™ Kit? Our new blu® Liquids are fully compatible with your original blu PRO™ Kit and clearomiser. Do I need to buy the new Cartridge Refills or blu® Liquids? Not necessarily, as some of our old e-liquid flavours can still be found on our site. For the new PLUS+™ Kits we’re introducing 5 exciting flavours you might want to try out. The new blu® Liquid flavours can be used in both PRO™ Kit versions so we’ve decided to replace the former e-liquids. Can I use my blu Starter Kit Rechargeable Device with the blu PLUS+™? 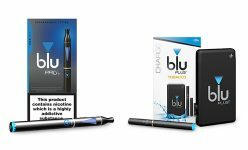 Your original blu Starter Kit Rechargeable Device is not compatible with our new blu PLUS+™ Cartridge Refills. What if I need replacement parts for my current blu product? We’ll continue a part of our accessories and batteries in our assortment. This way we make sure you can keep servicing your original system. For any remainder or additional questions our Customer Service is at your disposal. You can reach our Customer Service at for free on 0800 149 355 or email to support@blu.co.uk.